Garry Hesser, profesor of sociology, nominated his colleague, Tim Pippert, for the Excellence in Teaching award. In part, Garry wrote, "In addition to his consistent excellence in teaching a wide range of courses...my additional reason for nominating [Tim] is his continual effort to bring his students into 'high impact' experiences, most notably this past semester when he created a special topics course on social inequality, creating ways that our students can explore both 'ends' and the continuum of wealth and privilege/poverty in our community... This course was simply illustrative of the consistent and exceptional quality of teaching that Tim brings to his work that merits this recognition." Student Kaaren Warnes notes, "Tim's passion for the subject, as well as its implications for the world outside of the classroom, ignited our passions for the subject as well. Tim's teaching methods, his passion, his accessibility, and his concern for his students make him a deserving recipient for the Distinguished Contributions to Teaching award. I am truly honored to have had Tim Pippert as a teacher, mentor, and adviser." In speaking of Cass Dalglish, recipient of an Award for Excellence in Advising and Mentoring, colleague Doug Green states, "Cass has been a model and a mentor to creative writers through the example of her own life as an active writer and artist....Over the past 10 years, I've been witness to Cass's one-on-one mentoring and advising of novice journalists and creative writers. She has helped many seniors and graduates apply to and enter MFA programs." Doug adds, "I can't imagine our department and programs without Cass's thoughtful presence and fierce advocacy on behalf of our literary artists and journalists.... And regardless of whom she is working with and mentoring, Cass evinces an infectious love of literature and the craft of the writer." An Augsburg alum, Andrea Sanow was mentored by Cass in the writing of a novel. Andrea notes, "Cass was my cheerleader, my coach, my therapist, my friend, my dictionary, my enemy and most importantly, my antagonist." Of Cheryl Leuning, recipient of an Award for Excellence in Advising and Mentoring, DNP student Deb Schumacher states, "Cheryl is an exceptional woman and leader. She is uniquely able to be gentle and caring, yet with her astute analytical perspective she is simultaneously able to be clear in her vision of excellence for herself and those around her. She is also extremely fair, open-minded, and inclusive...pursing diversity of ideas and perspectives. Cheryl opens up students' worlds and encourages us all to be our best, to bring out our greatness to share with the world - either in our own backyard (locally) or in the grandness of the world (globally)." Cheryl's colleague, Sue Nash agrees, "Cheryl helps students understand the unique role that the Augsburg graduate can play in offering care to diverse populations. I think Cheryl's greatest contribution to Augsburg has been the design and implementation of our unique Masters of Nursing and now the doctoral program that truly embodies the core Augsburg values of critical thinking, justice, and community involvement in a diverse global society. In this way, she has advised and mentored us all." Nominated by colleagues David Matz and Bridget Robinson-Riegler, Nancy Steblay is the recipient of the Award for Excellence in Scholarship. Of Nancy's work, David and Bridget write, "Nancy possesses an impressive publication record by any standard. Since arriving at Augsburg, she has published more than 20 peer-reviewed articles â€“ most as lead author.... In recognition of her scholarship record, Nancy has been invited to serve on journal editorial boards and is sought after as an expert in her field." 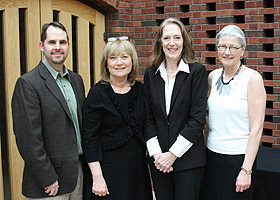 Further, they note, "Nancy has been a tireless promoter of scholarship among students and faculty at Augsburg." Former student Robert Tix agrees, "Dr. Steblay created so many different opportunities for me at Augsburg. She gave me an outlet for my scientific curiosity, whether that was helping with her research or conducting my own. She gave me an opportunity for critical thought and actual application on a continual, everyday basis. More important...was the opportunity she gave me to understand my own immense potential." This year's recipients will be recognized at Honors Convocation on April 15 and at the Faculty Recognition Luncheon on May 5. We also will celebrate the accomplishments of both the recipients of Distinguished Contributions to Teaching and Learning and Staff Recognition Awards at Community Time on April 26 at 3:45 p.m. in the East Commons. Please join us in congratulating the recipients of this year's Distinguished Contributions to Teaching and Learning awards!